Meet Baby. Baby is Monkey’s new best friend. Monkey loves to mimic Mom and Dad and has observed us take care of little Bear. Like a good mommy, Monkey feeds Baby (he even tried to breast feed her once), changes her diaper, pushes her in a stroller and tucks her in bed for naps. Baby goes everywhere with Monkey. Visit The Zoo to read more about Monkey and his Baby. LOL at the breast feeding. Like what you've done.on your site. Awww, he's learning how to be caring and loving. Very sweet! That is so sweet when they mimic our loving ways. Oh they learn so much from watching. So cute! 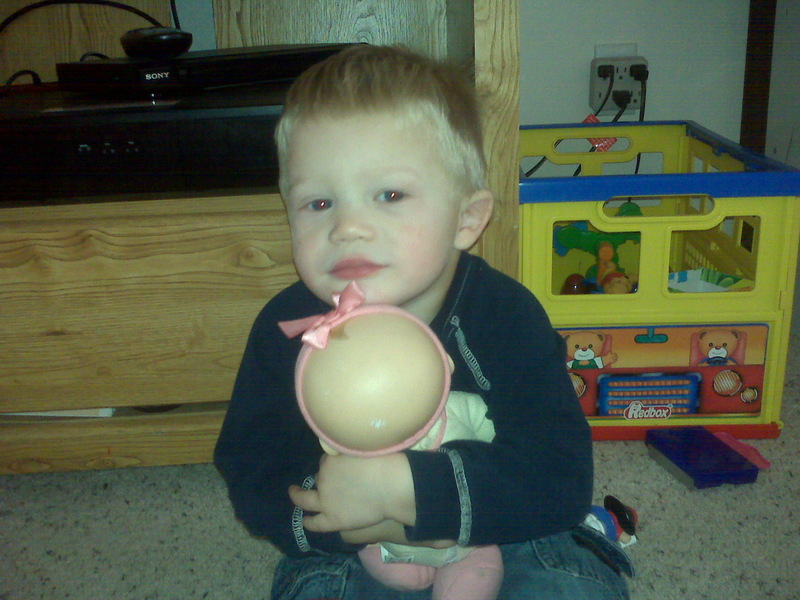 My kids all breastfed their dolls and stuffed animals too (yes, even my boys)! Thanks for all your kind comments! He is a sweet child and I enjoy watching him play with his baby.